D.W. was definitely a squeaky wheel and he got tons of grease, in the form of media attention and publicity. It paid off, starting with his record-busting early days at Nashville’s Fairgrounds Speedway and culminating with this week’s induction into the NASCAR Hall of Fame. Darrell never met a microphone or a camera he didn’t like. Waltrip drew attention not just to himself but to the sport in general. Fairgrounds promoter Bill Donoho said Waltrip was the best thing ever to come down the pike in terms of generating fan interest and selling tickets. He packed the grandstands on Saturday nights. Some came to cheer and some came to boo, but when Darrell was on the track the fans flocked. He fanned that same flame on a bigger stage when he moved into NASCAR’s major leagues. At first nobody knew what to make of the young hot-shoe who ran his mouth as fast as he ran his motor. D.W. was smooth and glib, looking, talking and acting more like a golf pro than a prototype Good Ol’ Boy stock car racer. No cowboy hats, boots and big belt buckles for Waltrip. No smokes or chaws. No dirty fingernails or shaggy hair. He talked as sharp as he looked, a tempest in NASCAR’s tea pot, going out of his way to mischievously roil the waters. And when the sport’s new TV audience began to tune in, Waltrip was ready and waiting. It was racing’s version of Harmonic Convergence – Darrell and NASCAR’s TV age. The perfect driver at the perfect moment. Richard Petty will probably go down in history as NASCAR’s most likeable and popular racer and Dale Earnhardt as the toughest and most competitive, but in terms of influence on the sport I rate Waltrip and Junior Johnson alongside Bill France Sr. He wasn’t just a motormouth – Darrell was a heckuv racer. Eighty-four wins. Three championships. During his prime in the 80’s nobody was better. After retiring following the 2000 season, Darrell shifted career gears and entered the Fox Sports broadcasting booth. His influence and impact continued – maybe increased. Nobody gets more ink and air time than D.W., 65 and going strong. Sure, he has his critics, has had, since he burst onto the scene in the late 1960’s. Back then fans would show up at the track wearing “Anybody But Waltrip” t-shirts. But the bottom line was, they showed up. Some loved him, some loathed him, but nobody ignored him. And what a show it was. And still is. just wish in all of his history, he had given just credit to R.C. Alexander, who made sure he had the best equipment to dominate at the fairgrounds, and for taking care of him during that time. he left R.C. a year too early, to go on his own. R.C., had to deal with the down turn in the car business, and asked him to wait one more year, but he didn’t wait on those who got him there.think it would have been a different outcome for both of them had he waited. and now he always leaves out that part of his resume. The right place at the right time…..NASCAR, TV and DW. You are so right, Mr. Woody, DW had a huge influence on NASCAR’s popularity and helped “stock car” racing transition to a corporate sport. Junior Johnson, as everyone knows, brought Winston to the NASCAR table and that kick started the corporate sponsorship money machine that allowed NASCAR to expand to a national level. Waltrip brought PR savvy to the sport and was a natural in front of a microphone and TV camera. Sponsors loved him….he was a winner (ok, and sometimes a whinner) and could talk up a ton of recognition…..for his sponsors and himself. 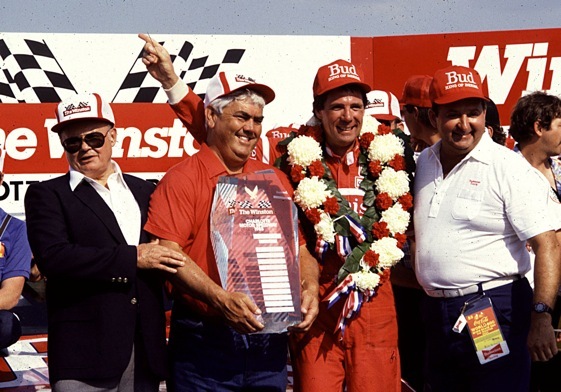 I thought Waltrip should have been in the first or, at least, second group of inductees. He was that influential in the sport. Glad to see DW finally made it into the Hall of Fame. Now he can quit whinning all of the time. Really wish he was announcing at a dirt short track somewhere instead of national TV.